The Northbourne Avenue of the future. The NCA is being urged to provide more flexibility in the planning rules. File image. The final version of the City and Gateway Urban Design Framework, a collaborative effort between the ACT Government and the National Capital Authority, has come under fire from community representatives and the property industry alike for being too prescriptive. 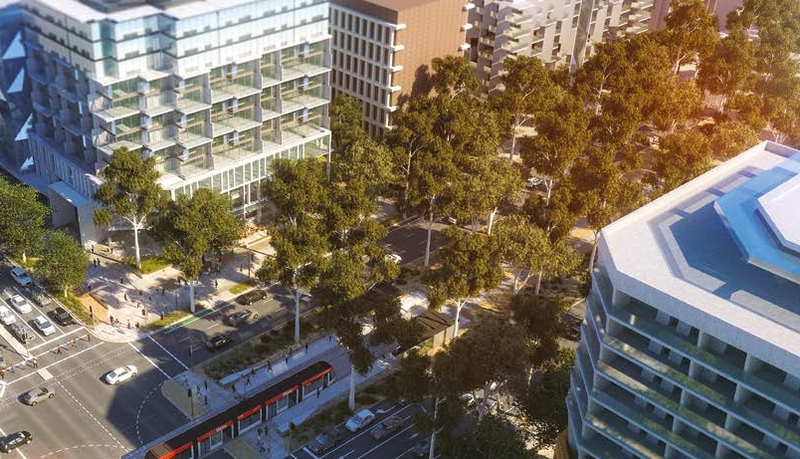 The Framework will establish the planning and design criteria for development along Federal Highway and Northbourne Avenue, the corridor into the city where 17,000 more people are expected to live by 2030 and along which the light rail Stage 1 project has been the catalyst for urban renewal. Submissions have closed to the NCA on its proposed Draft Amendment 91 (City and Gateway Urban Design Provisions) that will make the necessary changes to the National Capital Plan to implement the Framework. Submissions from the North Canberra Community Council and jointly from Property Council of Australia, Master Builders Association (ACT), Australian Institute of Architects, Australian Institute of Landscape Architects, Planning Institute of Australia, and the Canberra Business Chamber have both highlighted the need for more flexibility given the long-term nature of development along the corridor, although they differ on building heights in Downer. While the property industry has railed against the changes in building heights made to the draft Framework in light of community concerns, which it says will affect the viability of projects at key locations, the Council says the 18 metre limits on the eastern side of Northbourne in Downer are out of context and appear to be inappropriately high. The property industry submission says the impact of the changes made between the different versions of the Framework are poorly justified and may deliver outcomes counter to desired objectives. It says the changes, including a reduction in building heights from 18m to 12m between Panton Street/Barton Highway and Flemington Road/Phillip Avenue, have undermined certainty for many landowners within the corridor and will not deliver the number of dwellings and population required to support light rail, affecting its viability. “Having fully considered the draft and final Framework documents, the Stage 2 Engagement Report and the Downer Community Workshop Report, the draft amendment appears to have been strongly influenced by a design outcome that supports a low-density agenda. It is also important to note that landowners have undertaken extensive consultation over many years and have largely received positive responses from impacted residents and minimal objections,” the submission says. Permitted building heights from Antill/Mouat Streets Phillip Avenue and Flemington Road. Image: NCA. But both submissions agree that the marker building or node from the junction of the Federal Highway and Phillip Avenue should be reinstated, and are open to marker buildings at Flemington Road where the light rail enters the corridor. The joint property industry submission says a marker building on Flemington Road makes sense and the Community Council argues it would be helpful to include an outline of where future marker buildings could be located near the corner of Flemington Road. “We have no firm view what should be done on the EPIC frontages, but we expect that this site will undergo many changes in the course of the next 20-30 years,” the Council says. The Council also believes there is scope for higher building heights on the western side of Northbourne and the Federal Highway from Yowani to Flemington Road, with no discernible impact on existing residents. The two submissions also share concerns about the Macarthur and Wakefield Avenue intersections which allow building heights of 10 to 15 storeys – or 32 to 48 metres. The property industry says this is prescriptive and idiosyncratic and will mean a south-facing landscaped plaza on the northern side of the intersection would be overshadowed and windswept in winter. The Council believes the resulting buildings may impede vistas towards Black Mountain and Mt Majura, which are an integral part of the Griffins’ plan. The property industry submission says the proposed planning rules will increase development costs and impact on affordable housing, as well as limit design options. It proposes an alternative process to the ‘prescriptive’ planning controls, in which a Design Review Panel advises ACTPLA, the NCA and the proponent in a collaborative process that would win the trust of the community. The Property Council’s Adina Cirson said the NCA’s amendment had in effect changed the goalposts for landowners and developers along the corridor who had been planning projects based on the draft Framework. “When you have an 8000 square metre reduction in GFA (Gross Floor Area) between March and December with setbacks increased significantly, your height’s reduced by five storeys, it’s not hard to see that these projects are now in real danger,” she said. Ms Cirson said the Property Council would meet with the NCA on 5 April and was hopeful of achieving an outcome that was good for everyone. The North Canberra Community Council too is concerned about the ‘overall prescriptive nature of the amendment, given that the Territory Plan has in recent years moved towards an outcomes-based approach’. 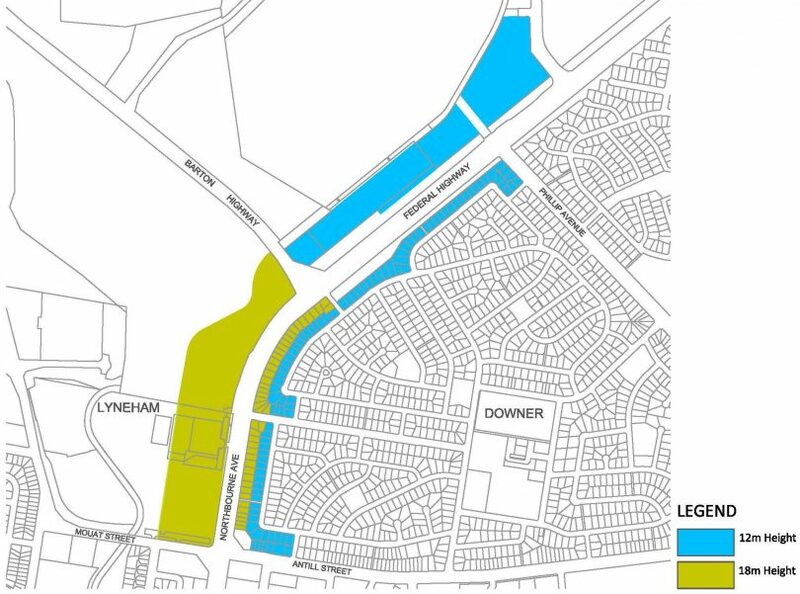 The Council also calls for provision for extensions of the path across Mouat Street to the Barton Highway and then to Flemington Road to provide a connection to Gungahlin and later possibly to the starting point of Sullivan’s Creek. “This is a vital piece of infrastructure that should retain the capacity to be improved and extended, in order to be able to meet Canberra’s evolving transport demands,” it says. It also believes a large-scale park and ride facility near EPIC would encourage interstate travellers and others to catch the light rail in either direction. The permissible heights in this area need to be increased. The people in the area voted heavily for light rail at the last election and have taken the huge property price rises that came with it. The price of that was always going to be significantly higher density and we should be looking at taller buildings here, it’s the only thing that made light rail viable in the first place. 12m is only 4 storeys, it should be at least 6 storeys.